RhineBuzz: ‘Knitting Peace’ and more at the düsseldorf festival! ‘Knitting Peace’ and more at the düsseldorf festival! With one of their visually most impressive shows, this year’s ‘düsseldorf festival!’ blew you away at half time! ‘Knitting peace’ is the name of the piece that kept visitors breathless for three nights of the festival. 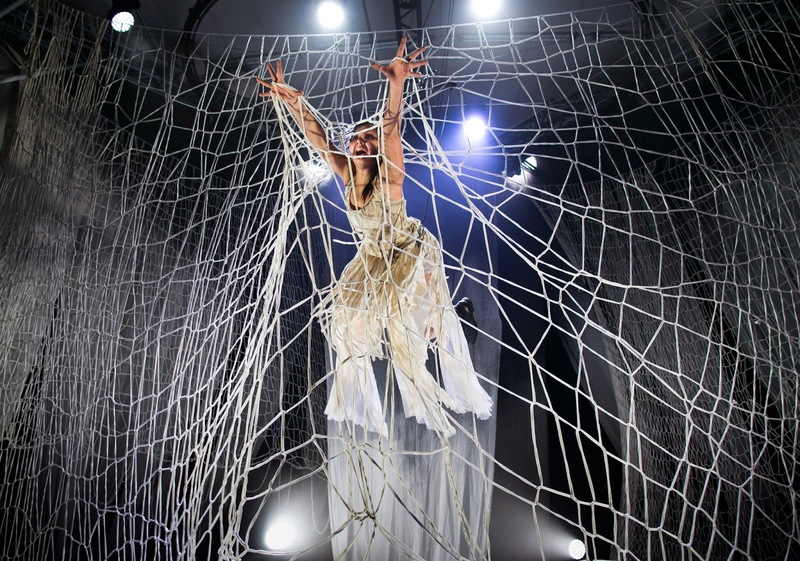 The Swedish ensemble ‘Circus Cirkör’, a project that has run for over 16 years now, and has been enjoyed by over 1.2 million people, presented their latest production of four artists and two musicians, sounding out the borders of theatre and contemporary circus. Exploring the genre of knitting, the artists played on - and above - the main festival marquee staging and fulfilled the first part of the show’s name by actually knitting part of the entwined stage set live before the audience's eyes. But if you were looking for 'peace', the grand Festival Marquee on the Burgplatz was not the right place for you. Vigorous moves and risqué tricks between thin ropes and knotted, knitted spiderwebs, together with the combination of violin and melancholiac, rocky electric sounds created a taught atmosphere in the tent. The acrobats, dressed in white or black, crawled, rolled, balanced, climbed and unicycled over the stage, reminding me of silkworms caught in their own nets, constantly building and destroying their cocoons. The festival runs until September 28 and is definitely worth checking out. Just as ‘Circus Cirkör’ blurs the lines between dance theatre and classic acrobatic circus, the düsseldorf festival! offers a wide range of concerts, dance, theatre, readings and everything in between; bringing together and eloquently crossing the lines of arts and culture. Highlights for the following week at the düsseldorf festival! If you enjoy contemporary circus, you might find the Aurélien Bory & Compagnie 111 production ‘Sans objet’ interesting. Their ‘Pas de Trois for Robots and Acrobats’ will be on in the grand festival marquee from September 23 - 25 at 8 pm. The interplay of violin and electronic sound, is presented with the ‘Inside Partita’ of Midori Seiler & Friends in the tanzhaus nrw. The mix of performative concert and electronic sound installation can be seen for two days on September 23 and 24 at 7.30pm. Even for fans of BreakDance and Indian Kathak the düsseldorf festival! has something to offer. If the combination of modern dance and hiphop does it for you, Kader Attou & Compagnie Accrorap bring their 'Vision of Mankind Dancing' to the Festival Marquee on the Burgplatz for Friday 26 and Saturday 27. The German premiere of their production ‘The Roots’ will be on at 8pm. Those who want to join the peaceful knitting revolution, please feel free to join the urban knitting project of the Mülheim-based designer Nora Peters, who, accompanying the festival and sponsored by the ‘Industrieeterrains Düsseldorf-Reisholz AG’, knitted her colourful woollen artworks round the pillars of the IDR-car park at the Carlsplatz. So if you can – join the knitting operation and knit for peace – or anything else that keeps you inspired!